Firstly, we would like to thank everyone for the support we have received since announcing the formation of the team in August 2016. The response has been extremely positive and with the release of the patches for Panzer Battles Normandy & Kursk, showcase the improvements we are bringing to the series. 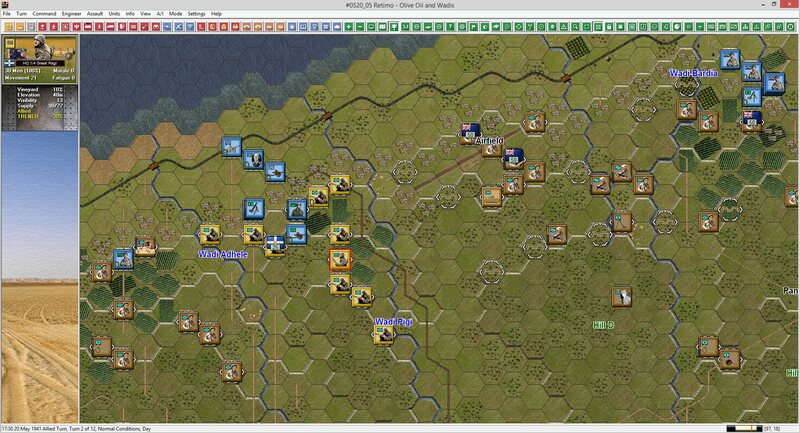 We are on plan to release the Panzer Battles Demo soon. We have just added all the top down graphics for all nationalities and are just awaiting a final scenario to essentially complete all the content. The latest version of the Demo will go to our play testers over the New Year and we will have a burst of testing for a month or two and then a release hopefully before the end of March 2017. Chris Maiorana is building two scenarios covering the fighting in the Bogodukhov region in Russia in August 1943. The fighting, just after the Kursk battle was both desperate and fluid with each side trying to overwhelm the other, in many cases from the march. Soviet Guards units will be opposing German SS and Wehrmacht formations. 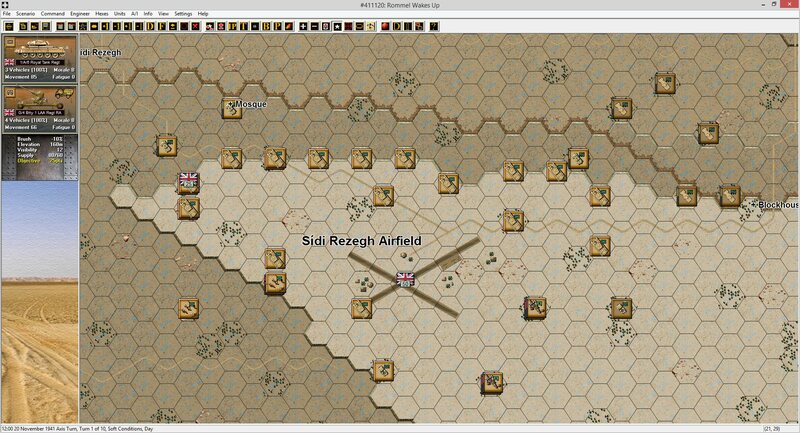 In North Africa, David Freer has designed four scenarios for Mersa Brega, the first battle the German Afrika Korps were involved in. There are two different scenarios with the historical forces and a hypothetical situation where the British have additional armour assets. There are also AI versions of both these scenarios intended to be played from the German perspective. Mersa Brega was the first blooding for the Germans but also the beginning of Rommel’s North African reputation. The fighting was extremely hard in what could have been an impregnable defensive position. 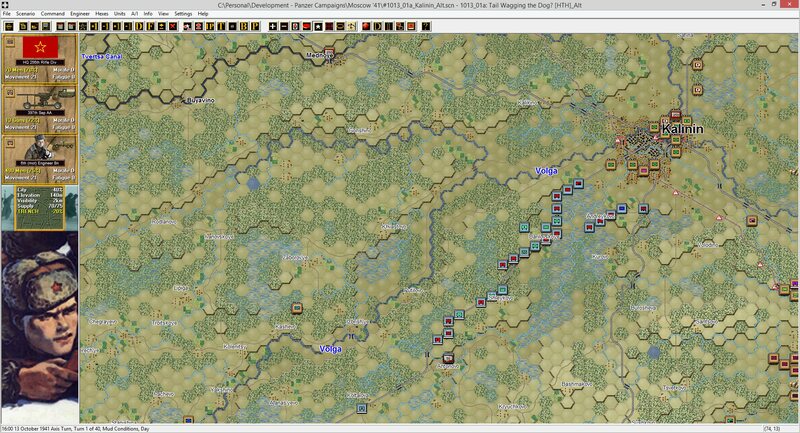 The last battle to be included in the Panzer Battles Demo is Joao Lima’s Battle of the Tenaru River. Joao has included both historical and hypothetical scenarios with the hypothetical assuming the 5th SNLF Battalion reinforced Ichiki’s force rather than being landed further along the coast of Guadalcanal. These scenarios are a test for us as we are trialling 125 metre hexes rather than the more standard 250 metre for these smaller battles. We want to get some idea how this works out as it may support some concepts we have for urban and jungle fighting in future titles. All together that makes 10 scenarios that will come with the demo, though there maybe a few more if we feel that player vs AI versions are required based upon testing. We expect to have the first DLC (downloadable content) sometime after the Demo release and the first one will hopefully contain the four Getting Started scenarios from Panzer Battles Kursk and Normandy converted to work with the Demo. We are planning a second DLC pack that will contain some of the excellent scenario work done by Chris Maiorana using Panzer Battles Kursk. These scenarios will also be converted across to work with the demo so there will be no need to own Kursk to play them. Work continues apace on Panzer Battles 3. We now have testing underway on scenarios set in the desert as well as Crete. The master desert map has had a substantial addition to allow us to add another complete campaign/set of scenarios. At last count we expect to have up to eight distinct battles/campaigns included with the game. The orders of battles have been done for all of these but only three operations have had scenarios designed for them to date. Much of the graphics have been done, which has been a huge task in itself. Currently we are working on completing the top down graphics based upon Ed Pacitto’s (Richie 61) excellent work. 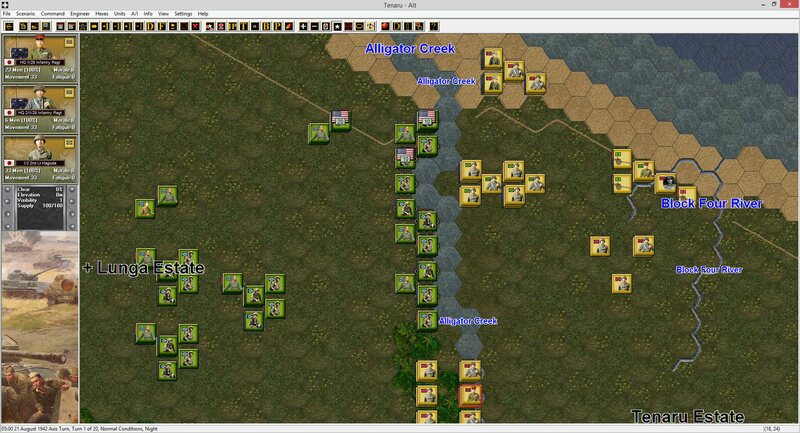 Here is a sneak peek at one of the first day scenarios in Crete with the Fallschirmjaeger landing at Retimo and facing off against the Greek and Australian garrison. Below is a look at another scenario in the desert, showing some of the top down graphics. Also note this is the current iteration of ‘soft’ terrain in the desert showing pools of water after a cloud burst. 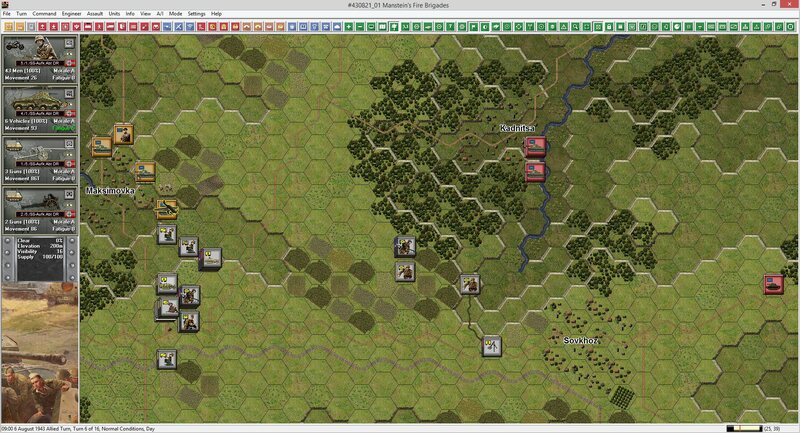 We have also been working on a new series of updates for the Panzer Campaigns series. The updates will include all new map and unit graphics as well as the full integration of Ed ‘Volcano Man’ Williams Alternate scenarios. This will hopefully give new life to this well-loved series with a more modern graphics look as well as the most often played alternate scenarios. To date we have completed 5 titles (Moscow 41, Moscow 42, Kharkov 42, Kharkov 43 and Smolensk 41) and are currently working on Rzhev 42. Our plan is to finish all the Eastern Front titles before moving onto the desert/Western Europe. The pace is not particularly fast as it is a bit of a filler while having a break from other tasks. Mike Amos has sent through some alternative 3D graphics and we will be looking at considering them for inclusion over the New Year. 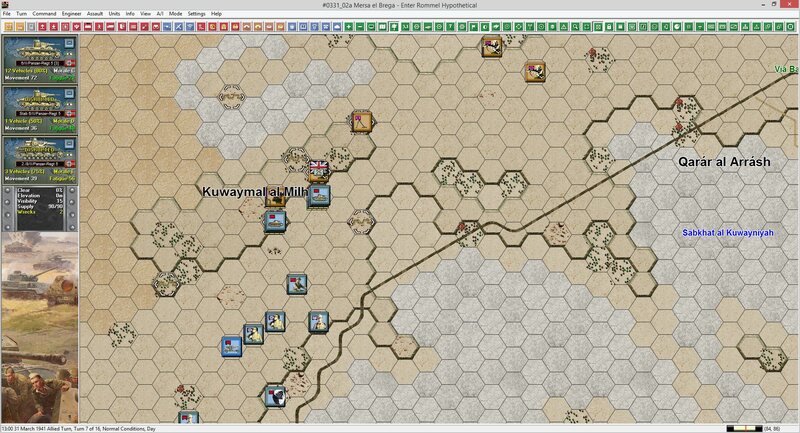 Here are a few screen shots from the Panzer Campaigns work done to date. Please note everything here is work in process and subject to change (for example many of the sidebars have not been updated). As you can see we have a range of projects underway that will keep us very busy in 2017. We wish all of you that have an interest in our work a safe and happy holidays and we look forward to sharing more in the New Year. This demo looks to be amazing and I can’t wait to try it! Is there a website that has some down load able scenarios for Panzer Battles Normandy. I would like to pick up that game but not sure if I should wait for the Demo 1st. I love the Squad Battles game series because of the smaller size battles that can be played in under an hour. Thanks for your comments. There is a good range of small, medium and large scenarios in both Normandy and Kursk. All the game documentation including the Getting Started notes are available for free download at John Tiller’s website. That will give you a good idea if the gamers or scenarios are of interest to you. Thanks for the response. 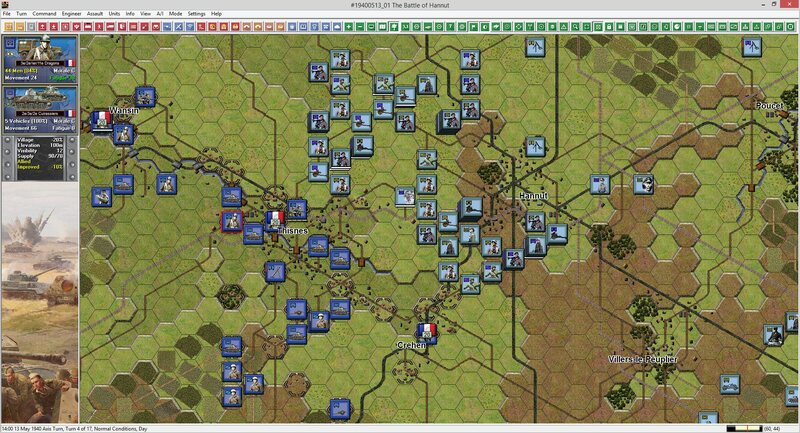 Is there any New Scenarios that can be downloaded for Panzer Battles Normandy anywhere on the Forums you know of? Thanks to your cool website with Tons of extra content I picked up Panzer Battles Normandy this weekend! I cant wait to get some more smaller scenarios for this game. I did pick up the Cassino Station Battles that Chris put up. Thanks David will keep an eye out for the demo! You guys are my heros! Breathing new life into my beloved Tiller games. 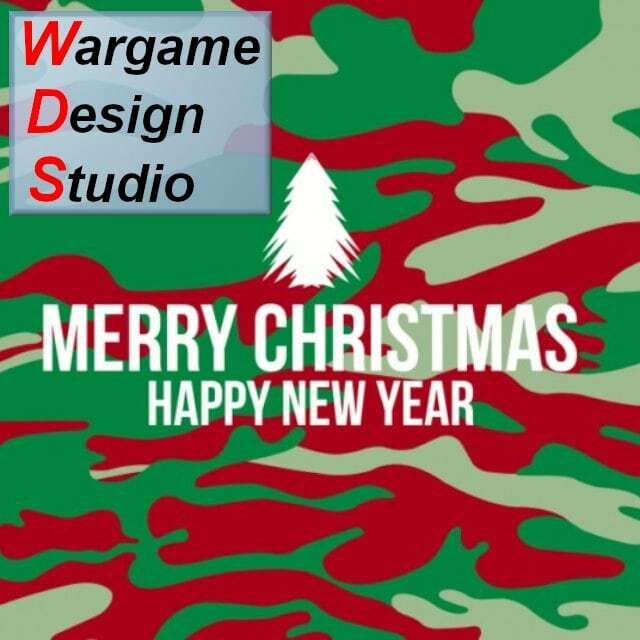 Merry Christmas to all and Happy New Year! P.S. I was a little apprehensive of the new UI…but it won me over quickly and then new information that is available on map is just great. Well done! Great to hear from you! They are our beloved Tiller games too and we believe that with a little attention they could be relevant for quite a while longer! Hopefully updating all the graphics and other enhancements will improve the standing of the games as only a small proportion of buyers realise there are mods to improve the look and feel. As far as the New UI, we have tried to make it as comprehensive as we can. Having both short cut keys and additional icons seems to have helped and other than some concerns about the actual keys used, it has been pretty painless. We have additional ideas for future UI improvements and they will all be tailored to simplifying both playing the game and providing relevant information easily. Nice info, i am curious about the Tenaru battle and how it works with half scale… specially intrigued with company HQs and how affect game. Ummm you talk about work in urban warfare but i dont see in demo scens a battle to cover this… maybe in future we can see a test scen??? if all the info about OOB creation is something more than an example and is a teaser… well, a Budapest title could include heavy urban warfare… i expect something like same hex counters from diferent sides and automatic combat based in fatigue to force autoretreats or similar. For Panzer Campaigns – when they’re done. We would like to release the updates for all 21 games simultaneously. As you can imagine that is a big job and there is a lot of work to do to get there. I’m currently working a refresh of all the 3D terrain graphics, which to my eye looks much better than the original. The 2D graphics are done and will look like the examples shown in this post. There is still a lot to do on the unit graphics but we have a sizable library that should cover nearly all the titles. 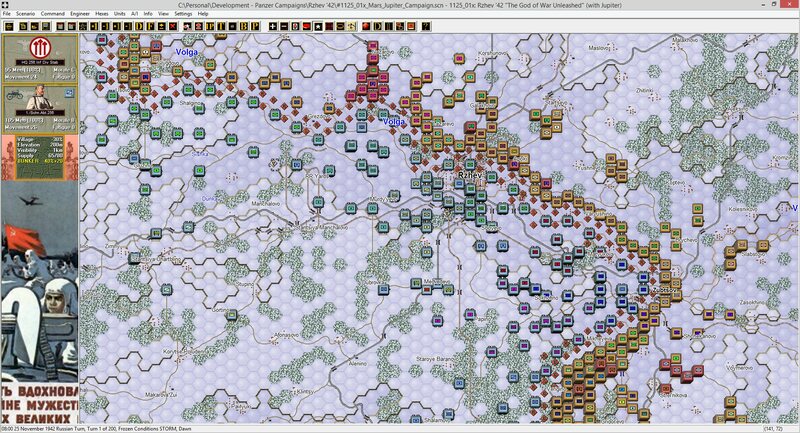 Love your evolution on the map graphics for the Panzer Campaign series of games. 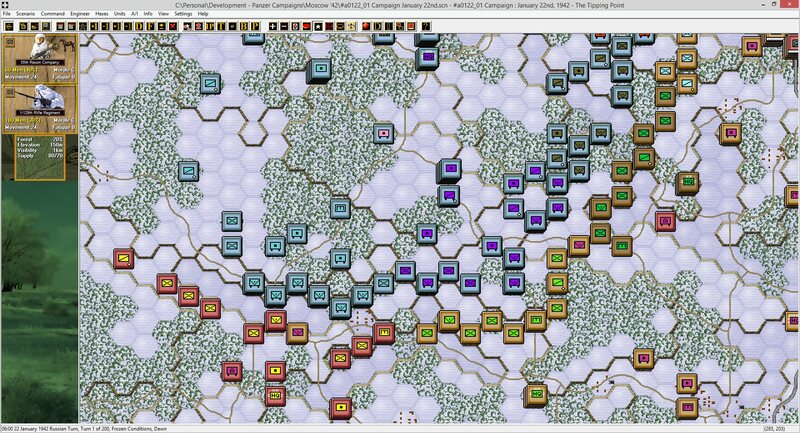 Also look forward to future Panzer Battles releases. Regarding the PzCamp updates, you stated 5 were in the bag and a sixth East Front title in works. As one who has the full set of PzCamp titles and has kept them up to date with the latest set of updates/patches, where does one get these latest updates? Last update on the JTS site was 2015 – before your year end status update. If not yet formally released, then that explains it. Otherwise, how does one get those updates. Firstly, thanks for all the support, Panzer Campaigns is a great series! None of the Panzer Campaign updates have been released. My plan is to get most, if not all the games updated and then release in one pass. That may change and if so I will do it by theatre. As mentioned I’m currently doing the East Front and that will cover the most titles. Doing a theatre at a time allows me to reuse a lot of the artwork and speeds up the process as I’m focused on one set of graphics etc.. Right now I have been redoing all the 3D for a better look and feel. The updates will also include all the Volcano Man mods. 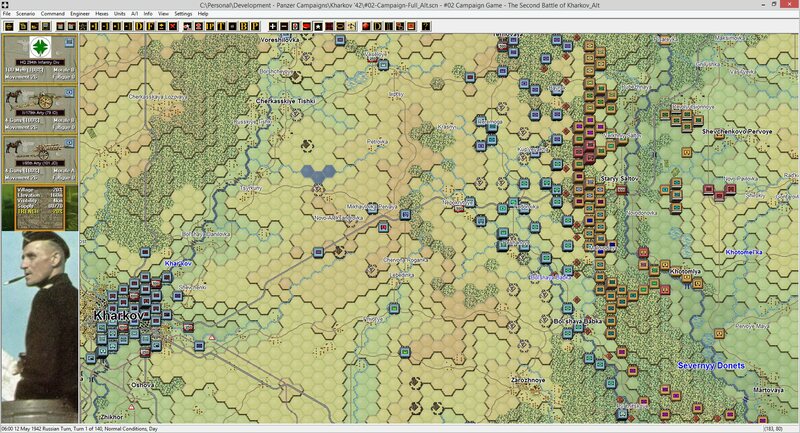 Unfortunately, I have had little time of late on Panzer Campaigns as we’re trying to wrap the Panzer Battles Demo. We will post here and at Tiller’s site once the updates are released.